A tropical smell and taste that many people may associate with summer and holidays, coconuts offer far more than a refreshing drink in the sunshine. Coconut oil is an edible resource and has a range of benefits and uses, both inside and out. In some parts of the world, coconut oil is regularly consumed and has been for many thousands of years. 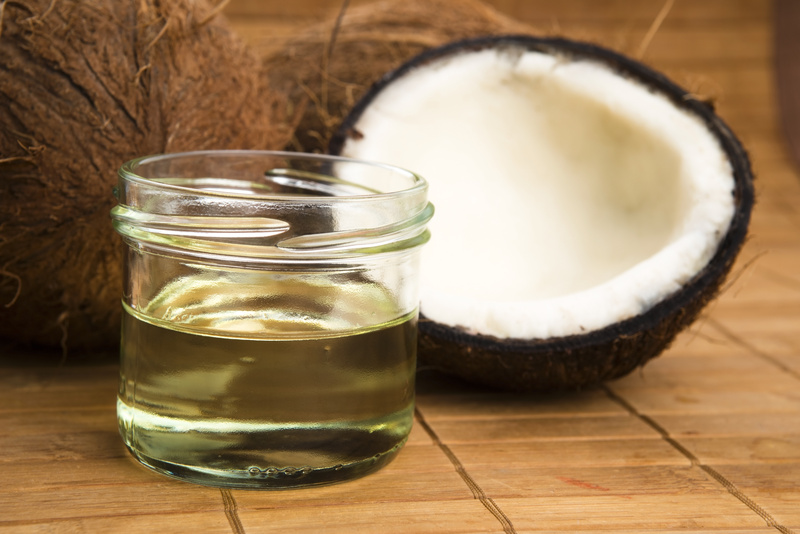 We take a closer look at the different uses for coconut oil and the benefits of coconut oil that you could derive by introducing it into your life. What is coconut oil made from? Coconut oil is made primarily from fats, but before you dismiss the idea of using it because of this, it’s worth reading on as the facts aren’t as clear-cut as you might think. • Saturated fatty acids – these are primarily medium-chain triglycerides, a composition which is supposed to be able to assimilate particularly well in the body. The main type is lauric acid, making up more than 40% of the total followed by caprice acid, caprylic acid, myristic acid and palmitic. • Poly-phenols – also known as gallic acid, polyphenols are responsible for providing that authentic coconut smell and taste. Virgin coconut oil is particularly high in gallic acid. • Vitamin K, vitamin E plus minerals including iron. Although coconut oil is made from more than 90% saturated fats, they aren’t necessarily bad for you. If you are on a restricted fat diet you certainly need to take care before you ingest any, but the tropical benefits are still extremely useful. For those not on a restricted fat diet, although, like any type of fat, coconut oil should not be eaten excessively, studies suggest it can actually help to lower cholesterol levels and aid weight loss. This is because of the types of fats contained within the coconut oil. More research is currently being carried out into the subject but there’s firm evidence to suggest that medium-chain fatty acids play a significant role in aiding weight loss. This is thought to be because their molecules are made up of just 8-10 carbon atoms, in contrast to the 12 or more typically found in longer chain fatty acids. Lauric acid, the main component in coconut oil, is also widely considered to be a ‘healthy’ type of fat and one which has the opposite effect to what you might expect. Used in the right way lauric acid can actually reduce the ‘bad’ LDL cholesterol in your blood and increased the ‘good’ HDL cholesterol. This makes it a particularly desirable substance and one which can contribute to improved health, including the cardiovascular system. With its unique combination of fatty acids, coconut oil has been classified as one of the few so-called ‘super foods’. When you are looking to purchase coconut oil, it’s worth bearing in mind that there are two different types: virgin and refined. The latter involves more processing and arguably removes some of the nutrients as a result. It’s not possible to get totally virgin coconut oil because in order to extract it, some processing is required. However with virgin coconut oil, processing is kept a minimum and all the nutrients are preserved. All types of coconut oil have considerable health benefits and how important using virgin oil is depends how and where you planning on using it. For example, coconut oil is fantastic for shining up patent leather shoes and obviously for this, refined oil would be fine. In direct comparison, if you are taking it as a supplement or eating it as part of your diet, the virgin coconut oil would deliver better all-round benefits. The one type of coconut oil which should always be avoided is hydrogenated; this contains trans fatty acids and can pump up the levels of ‘bad cholesterol as well. Vegetarians often miss out when it comes to taking supplements with either the casing or the contents breaching their principles. Fish oils such as krill oil deliver powerful antioxidants and omega-3s but because they are derived from marine life, they aren’t suitable for vegetarians to take. Coconut oil delivers very different benefits to fish oils but still offers a range of health benefits such as reducing the risks of heart disease and diabetes. Another advantage is that coconut oil is solid at room temperature which makes it a great alternative to use as a spread, or in place of butter or dairy products. Vegans don’t eat any derivatives of animal products which mean coconut oil is a perfect substitute for them. A Paleo diet is another increasingly popular choice, where advocates don’t eat dairy products. Coconut oil is a viable alternative that won’t compromise their food choices. Although coconut has many health benefits, it can be used cosmetically too and can provide hair with a stunning lustre and shine. One of the best all-natural nutrients for hair, coconut oil can be used to both make your hair look good and to encourage it to grow. In the Indian sub-continent, coconut oil is regularly used in hair care, being rubbed into the hair every day after bathing or showering. It can help to heal damaged hair and can also help to prevent protein loss, one of the causes of unhealthy hair. Coconut oil is also an excellent conditioner and encourages the regrowth of hair which is healthy and in the best possible condition. Lice and dandruff are two of the most unpleasant scalp conditions but if you massage coconut oil into your head regularly, you should remain free of both. Applied topically, coconut oil offers excellent protection to both the hair and scalp, leaving locks soft and gleaming and skin well-hydrated and nourished. It’s not just the hair on the head that can benefit from the topical application of coconut oil. Applying skin all over the body can really help to prevent dryness and can effectively treat conditions such as psoriasis. Coconut oil can be used to moisturise the whole body, and the effect can be compared as similar to mineral oil, minus the adverse side effects. It can treat flaking and dryness, but also safeguard against sagging and wrinkling of the skin too. Coconut oil is used widely as an anti-ageing preparation because of the nutrients it delivers topically. Keeping the skin moisturised it can prevent it breaking down and getting infected. This is particularly important with conditions such as eczema, dermatitis, acne and psoriasis; a moisturised skin can help to prevent complications developing and may reduce the symptoms too. Because it is so gentle yet effective, coconut oil forms the basis of many preparations used on the son such as soap, creams and lotions. Despite being so rich in fats, coconut oil has some qualities which can actually contribute to a healthy cardiovascular system, and help to prevent heart disease. The saturated fats that are present in coconut oil do not behave in the same way as those found in vegetable oils so whiles caution still needs to be exercised in order to avoid consuming too much, a healthy intake can have very positive effects. Lauric acid makes up around 50% of the total composition of coconut oil and this has been proven to be beneficial for the circulatory system and the heart. Lauric acid actively reduces the risk of heart disease by preventing high blood pressure and raised cholesterol. Coconut oil does not contribute to higher levels of the bad cholesterol known as LDL. Rather, it reduces the overall level of cholesterol, pushing down LDL and helping to boost the ‘healthy’ cholesterols found in the blood, HDL. More research is yet needed into this area, but there are many indications that coconut oil can help contribute to a healthy weight loss programme. Medium chain fatty acids are thought to play an integral part in this, but it’s not yet known how this happens. Some of the other effects of coconut oil also contribute; being so easy to digest, it boosts the functions of the endocrine system and the thyroid gland particularly. It also helps the pancreas to work more efficiently, removing stress and thereby boosting the natural metabolic rate. This helps more weight to be burned off internally. Areas where coconut oil is used regularly in cooking have been noted to have very low levels of obesity, further supporting the claims that when used responsibly and as part of an overall diet programme, coconut oil can aid weight loss. The body’s immune system is at the heart of many conditions; if it’s run down and in poor condition, it’s much easier for inflammatory diseases to develop and it can even contribute to the chronic problems such as coronary artery disease. Coconut oil can help to protect the immune system. This is due to the lauric acid, antimicrobial lipids, capric acid and caprylic acid which help to make up the oil. These components have a variety of qualities including antifungal, antiviral and antibacterial. Lauric acid is once again a significant ingredient. The body converts this to monolaurin which is known to help fight both bacteria and viruses, thus helping to eliminate diseases including influenza, herpes, cytomegalovirus and potentially even HIV, although far more research needs to be done with the latter. The digestive system in particular can help be protected by coconut oil as helicobacter pylori, listeria monocytogenes and giardia lamblia can all be eliminated or their effects reduced. The digestive system overall is very receptive to the effects of coconut oil and ingesting it, or using it in cooking can deliver some very powerful benefits. The antimicrobial qualities of the oil are responsible for helping to keep bacteria and fungi under control, as well as reducing parasites. This can ease conditions such as indigestion, heartburn and even irritable bowel syndrome. By keeping the bowel well protected and calm, stress related and spasmodic conditions can improve. Outside the stomach, the effects of coconut oil can also help the body to process other food types more effectively. Amino acids, vitamins and minerals can all be absorbed far more easily when coconut oil is simultaneously present. Using it as cooking oil is the recommended way to ensure you receive the necessary intake of coconut oil without being excessive. As it is a non-irritant, coconut oil can be applied directly to the infected parts of the body and in doing so, a protective barrier will be formed. This will be impervious to bacterial, viruses, fungi and even dust in the air, promoting healing and preventing any further contamination. The Coconut Research Centre has published studies which suggest that the oil can play a major role in treating a wide number of infections including those caused by both bacteria and viruses. Some of the illness it has been suggested that coconut oil could help to treat includes measles, herpes, hepatitis, SARS, pneumonia, urinary tract infections, ulcers, throat infections and gonorrhoea. Coconut oil is also very effective in dealing with yeast and fungal conditions and can be used to get rid of ringworm, thrush, nappy rash and athlete’s foot. Depending on the benefit you want to gain, coconut oil can be used in a variety of ways. Here are some suggestions about how you might like to use this precious oil. • Banish lice – wash hair in apple cider vinegar, let it dry and then smooth coconut oil through the lengths. You’ll need to wait for 24 hours and then you will be able to simply comb out your hair, rinse it clean and you will be nit-free. • Prevent nosebleeds – although there can be lots of different causes, dried out nostrils can be a major contributory factor. Prevent cracking and chapping by dipping a finger in coconut oil and gently smearing inside the cavity. • Get baking – if you’re making cakes, pies or any other kind of baked goods, you can substitute butter for coconut oil. This will give the end product an extremely light consistency. In most recipes, it can be substituted on a one-for-one basis. • Horrible hairs – to stop your cat suffering the misery of hacking up fur balls, you can use coconut oil to help their digestive system. The easiest way to get it into them is to coat their paws. • Banish irritation – if your pet is scratching away at a particular area and has inflamed or irritated skin, coconut oil can be a great way of easing irritation and taking away the desire to scratch. You might just want to check with your vet before applying it. • Squeaky clean – the bath or shower takes a pounding from grime every day but if you want to avoid harsh chemicals simply wipe some coconut oil around the tub or cubicle and watch as the scum just washes away. • Leather up – whether it’s a sofa, a jacket or some trousers, leather goods have the ability to last for many years, but keeping them in prime condition isn’t always as easy. Wiping any leather goods over with coconut oil will condition, clean and protect the surface and restore a healthy sheen. If you’ve never used coconut oil before, you may not have realised the full extent of its potency or the vast number of different benefits it offers. Used externally, it can help soothe, calm and treat inflamed and irritated skin as well as coat hair and help it stay soft, luscious and in great condition. In cooking, coconut oil adds a real depth of flavour and can provide a brand new taste to established recipes, rejuvenating them overnight. But it’s the medicinal uses of coconut oil which really offer the greatest benefits. High in the right kind of fats, the benefits of coconut oil coconut oil can help to protect virtually every system in the body, reducing the incidence of heart disease. Lots more research needs to be completed to conclusively prove the full extent of the possibilities that coconut oil could deliver. However, with preliminary research returning such positive results, with no documented side effects, it seems inevitable that it’s only a matter of time before coconut oil becomes an established treatment for a wide range of illnesses and conditions.